Houston Texans DI Christian Covington suffered a season-ending elbow injury in his team’s 41-38 loss to the Seattle Seahawks in Week 8. 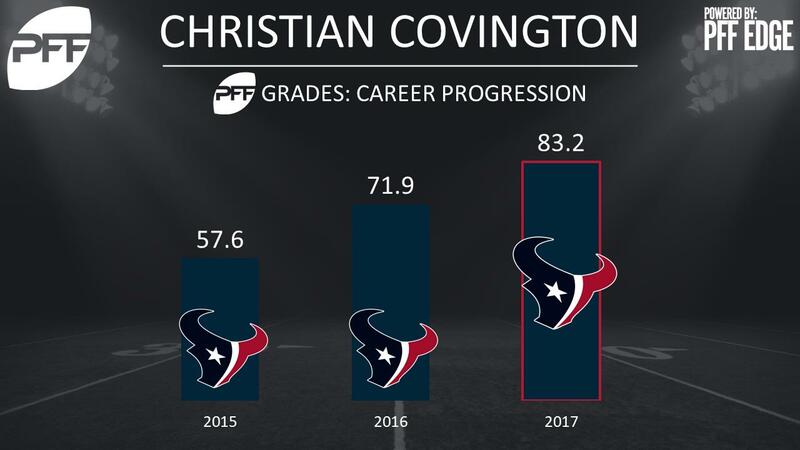 Covington was having a breakout year; his season grade of 83.2 ranked 26th among all interior defenders through eight weeks. Covington was in the midst of an excellent day against the Seahawks, posting an impressive 89.9 run-defense grade in the game before getting hurt. He had been a force in the run game all year, ranking 21st among all interior defenders with a run-defense grade of 84.4 for the season. The former sixth-round pick of the Texans had also made strides as a pass-rusher, notching a pass-rush productivity score of 9.3, which ranked ninth among 3-4 defensive ends. With J.J. Watt already out for the year, the Texans have now lost their two highest graded interior defenders for the season. The next man up for the Texans will be former undrafted free agent Brandon Dunn. Dunn has played 143 snaps so far in 2017, receiving an overall grade of 70.4.